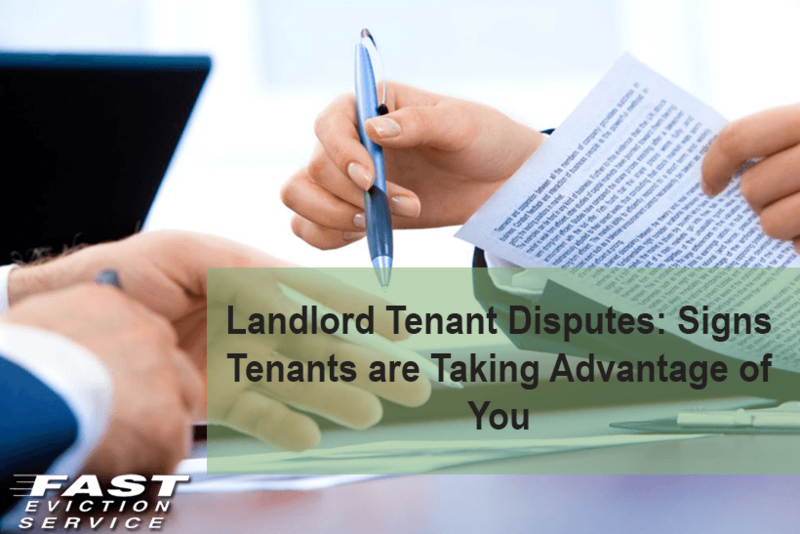 Landlord and tenant disputes are very common in the rental industry, and take place in one form or the other. At times, these are very simple such as making noise and at others, they are quite complex, involving criminal activities and illegal drug usage. Though only about 20% of your tenants will actually cause disputes, they will account to nearly 80% of your problems. The figures may surprise you, but that is regarded as a rule of the thumb regarding landlord tenant disputes in the California rental market. As a landlord, you will have come across many tenants who are quite problematic honoring the landlord tenant agreement. As long as they do not cross the limits and pay heed to your warnings that is fine. But there are some instances, when tenants start taking advantage of their landlord, and things start getting out of hand. So how would you know if one of your tenants was doing this? There are many signs that can help you figure out if your tenants are taking advantage of you and repeatedly causing landlord tenant disputes. They habitually cause the same problems and pay no heed to your warnings. Here is a look at the most common signs when the landlord tenant agreement is not being honored and you need to take action. In any business, you just cannot do with late payments because they make it difficult for you to manage your operational expenses. A tenant whose payments are late once or twice is fine, but if they are doing it every month, they are not honoring the landlord tenant agreement and they are trying to take advantage of you. Maybe they think you are not going to take any action against them and they make it a habit or maybe they just do not care. Whatever be the case, late payments is something that no landlord can bear, and before the situation becomes worse, deal with it promptly. A tenant who does not pay any rent at all is worse than one who pays it late and dealing with this is going to be more difficult to get the landlord tenant agreement honored. The best possible way is to prevent yourself from getting into this situation is to take measures when the payments start getting delayed. In case, you fail to do it then, you may have to send your tenant an eviction that can eventually lead to legalities as well, should your tenant cause further problems. Include late payments and deferred payments in your lease agreement so that you can deal with this in the best manner. There are a lot of residents who take good care of their homes, even when they have rented them out. As for others, they damage stuff that does not belong to them. The tenants may either leave a hole in your wall or take fixtures away when they vacate the premises. Once again, make sure the lease contains a ‘no alterations’ clause and clearly states what the tenant is permitted to do and what they are not. Also mention another clause that states what the tenant will have to do should they violate the lease. For instance, if the paint is changed, ask them to do the wall white again, or request them to get the holes in the walls filled. And if a tenant completely fails to listen to you , deduct appropriate amounts from the security deposits. There are certain tenants who allow their partners or friends to stay with them. They try to take advantage of you and are under the assumption you are not going to tell them off. Let your tenants know beforehand that any additional people cannot stay for more than a fixed amount of time. If that happens, make clear the landlord tenant agreement is not being honored and charge a fee for it. Run a thorough background check on your tenants before you close the deal. This is the best way to ensure you are handing over your unit to a responsible individual. Go through a tenant’s credit report. Prepare a proper lease and provide tenants a written document stating the rules and regulations to avoid landlord tenant disputes in California.